Heavy-duty and spacious, this 46" square span leg outdoor table provides generous seating for up to 8 adults. Elegantly styled, the open design of this expanded steel table allows for a more comfortable and convenient experience. 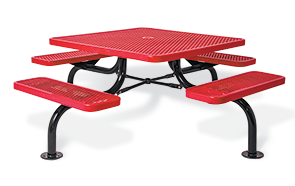 Highly stable and versatile the expanded steel bench seats and table top are securely supported by the MIG welded 2-3/8"O.D. powder-coated steel tube frame. Finished in the industry's most durable polyethylene coating, this finish provides protection for all-weather conditions while requiring virtually no maintenance.